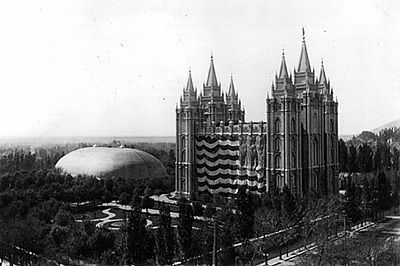 Some of my earliest and best biology professors were Mormons — Latter-day Saints, or LDS — and from them and a few others I learned that LDS beliefs not only do not cut against evolution, preaching against evolution is “false doctrine” in the faith, since there has never been a revelation against evolution to the LDS prophets. On the board of the National Center for Science Education (NCSE) has long sat Duane Jeffery, a devout Mormon and long-time supporter of evolution as a professor of biology at Brigham Young University. But as we know from the Methodist and Presbyterian and Catholic and other examples, official church doctrine doesn’t prevent members of the churches from jettisoning their reason when they discuss evolution and demonstrate a failure to understand even the basics of the simple theory. Mormons aren’t immune there, either. Alas. Here’s an LDS blog where the authors are trying to argue that “philosophically,” creationism should be taught alongside evolution, since it’s a “better” myth than science. Or something like that. All that high-falutin’ use of six-syllable words, e.g., epistemology, makes me think that the words don’t mean what the authors think they mean, especially when the authors then go on to make foolish claims based on something they think they’ve “proven” logically. My tolerance of six-syllable words has been reduced by dealing with actual laws, I think. Or perhaps, as I suspect, they’re just trying to claim that pigs fly. “Knowledge is the glory of God” is what I remember* one engraving over one entrance to the campus of Brigham Young University, except when the epistemology is found to be offensive, or something.